The ongoing crisis in Japan is an enormous human tragedy. And there are less immediately pressing but still considerable side effects–Japan is a key location for much of the world’s high tech industry. From NAND flash to GPS, here’s how the earthquake and tsunami will impact the industry. The ongoing disaster in Japan is an unprecedented human tragedy. And there are less immediately pressing but still considerable side effects–Japan is a key location for much of the world’s high tech industry. How will the earthquake and tsunami effect the industry? NAND flash memory is hiding inside your iPad, iPhone, SD cards, and pretty much every other tablet being made–it’s the type of static memory that acts as long-term storage because, unlike normal RAM, it retains the data when there’s no power flowing to the chips. Toshiba, which holds around 35% of the world’s NAND flash market, suffered a power outage in a key production facility in northern Japan during the disaster. And though the scope of the impact hasn’t been revealed, a brief power glitch in December caused production in January and February to fall by 20%. SanDisk has its own facilities in Japan and reported that although there was a power outage, and damage to a number of in-production chip materials occurred, production quickly resumed and the company expects a minimal impact to its supply chain. DRAM is a static memory system that’s speedy, reliable and volatile–it loses stored info when there’s no power. 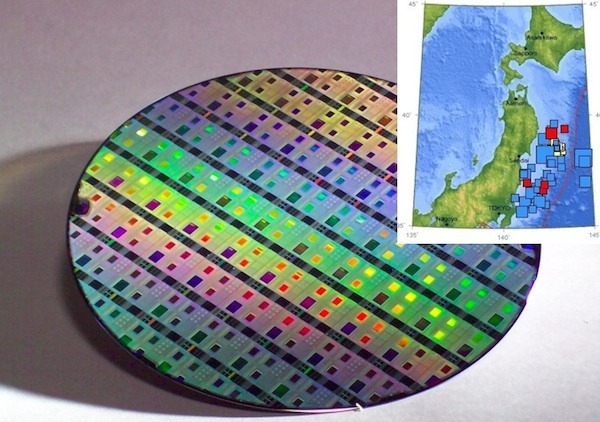 Reports today suggest DRAM chip suppliers are now not offering new quotes for sales after the Japanese earthquake, because they can’t guarantee supply of raw chips from wafer fabrication plants in Japan–and hence can’t offer meaningful prices to clients. Attention is focused on three facilities: Elipda, Shin-Etsu, and Sumco. Market prices for some types of DRAM chip rose today by around 7%. These firms also produce blank silicon wafers for other chip foundries: Shin-Etsu rolls out around 1.2 million 12-inch wafers per month. The firm revealed that operations in several of its plants in north Japan were ceased, and haven’t restarted because of ongoing electrical supply problems. The upshot may be a reduced production capability for some chip-maker clients in the weeks ahead, once they’ve burned through their stockyard inventories. Sony’s battery technology is included in several other manufacturer’s products as well as its own lineup of personal electronics and laptops (remember the furore created when a production glitch was causing the Li-ion batteries in numerous brands of PC explode?). Sony has two battery factories in Fukushima province, near the worst affected areas, and they are both closed. If they don’t reopen in two to three weeks, Sony’s production could fall short by 8-10 million cells, which will increase prices and competition in the market from rivals whose facilities haven’t been affected. Ongoing power supply shortages in Japan are forcing rolling blackouts in the nation, as an attempt to ration supplies–this is due to infrastructure damage, and the failed nuclear reactors in the north. Because of the power outages, some of the above industries may continue to be affected until Japan can stabilize its electricity grid. But other industries are affected too–Sony’s turning off the servers that run its very popular Final Fantasy MMO, and a number of other key online services it offers to its global gaming userbase. They’ll be off for at least a week. One unexpected long-term technological side effect may hit many people in Japan for quite some while. Indications from global observatories suggest that Japan’s coast has actually shifted some eight feet–it’s been confirmed by at least one hyper-accurate ground-based GPS station in the nation. As a result, accurate digital maps of Japan will be offset by a number of meters from where GPS navigation systems think they are actually located. Recent research in the U.K. has revealed that we, as a society, may be dangerously over-reliant on GPS tech, and Japan may suffer long-term mistakes caused by GPS mis-navigation.